Combi boiler reviews are a great way to “try before you buy”. 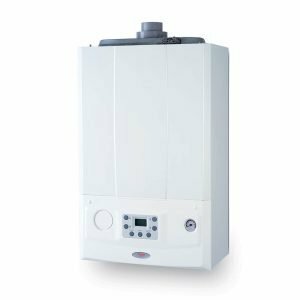 This post looks at the best combi boilers available in 2019 and aims to give a short, useful review for each. Market leader in the UK for many years, they continue to make solid boilers with a widespread network of engineers and accredited installers. Worcester Engineering was founded in Worcester, England by Cecil Duckworth in 1992. It was acquired by the German company Robert Bosch GmbH in 1992, hence the name Worcester Bosch as it is known today. Despite their previous high reputation, Worcester Bosch have recently faced increasing criticism on combi boiler reviews sites online for alleged poor after-sales service. They’ve also not bothered to improve the quality of their internal components. They continue to use aluminium for their heat exchangers, which is a lower quality metal compared to stainless steel that is increasingly used by their rivals in the UK. This has also resulted in reliability complaints for them. Worcester Bosch also experienced a data breach in May 2018 that revealed the home addresses of thousands of their customers. 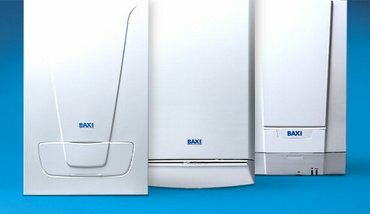 One of the UK’s most beloved boiler brands, Baxi began in 1866 by Richard Baxendale, an iron founder in Preston, Lancashire. Today Baxi is part of BDR Thermea, based in Apeldoorn, Netherlands. 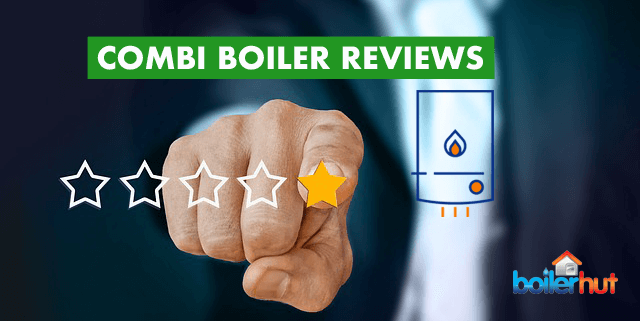 Once one of UK’s premier boiler brands, their reputation has declined rapidly when it comes to combi boiler reviews. Ideal Boilers launched in 1906, and have been active for over 100 years manufacturing one of the highest selling boilers in the UK. 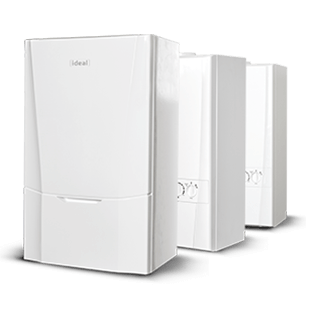 Ideal used to be one of UK’s premium boiler brands years ago, but today are known more for making affordable or “cheap” boilers. Their technology and reliability may not be the best in the market, but they’re solid boilers if you’re not particularly interested in high energy efficiency or reliability. What’s good is Ideal have recently revamped their boiler range to address some of the concerns. Time will tell if they’ve done a good job and if they can make their way to the top of combi boiler reviews in the future. Vaillant Group is present in over 20 countries with national sales companies, and exports to more than 60 states. A family-owned company active for more than 141 years, their core business is heating technologies, and they’re the second-largest European manufacturer behind Viessmann in this sector. Vaillant manufacture in the UK as well as Germany, France, Spain, Italy, Slovakia, Turkey and China. Number 1 heating technology manufacturer in Europe, and probably the world, but surprisingly lesser known in the UK domestic boiler market. Viessmann are one of the world’s premium commercial heating brands, and many of the world’s largest commercial buildings run on Viessmann central heating. These may include the Principality Stadium and Wales Millenium Centre in Cardiff, UK. And the Vaillant manufacturing plant in Germany. Grant Engineering have been designing and manufacturing heating products for four decades now. 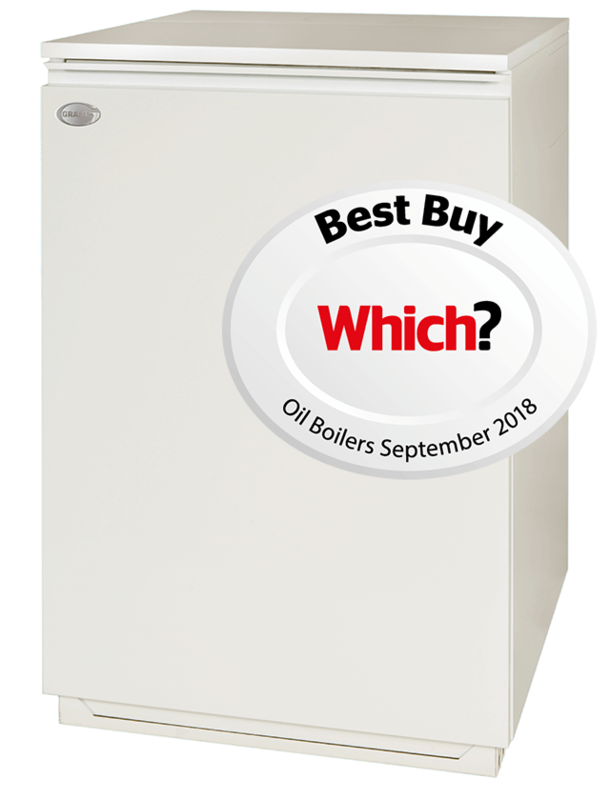 Their range of oil-fired condensing boilers feature at the top in all oil combi boiler reviews, and have received nothing but praise and positive reviews by reputed review magazines and websites in the UK. Grant’s oil-fired condensing boilers range have a reputation for quality and reliability, on top of being easy to install and maintain. The Grant Vortex and VortexBlue oil boiler range is trusted by engineers and householders all over the UK. In 2016, Grant sold more Vortex and VortexBlue oil condensing boilers than any other oil boiler brand in the UK (source: EUA). And for 2017 and 2018, a prominent consumer research magazine in the UK awarded the entire Grant range a “Best Buy” stamp of approval. Not very well known in the UK at all, this Dutch manufacturer makes one of the highest efficiency boilers in the UK, alongside Viessmann of course. Their iCon stainless steel heat exchanger is a very unique design, patented and manufactured in-house by ATAG. So, much like Viessmann, their heat exchanger cannot be copied or used by other brands. Furthermore, rival brands like Ideal, Baxi, Worcester Bosch, Vaillant, Glow Worm, Potterton etc. may use the same aluminium heat exchanger, sourced by a third party manufacturer called Giannoni, based in France. Another impressive Dutch manufacturer with a unique solution when it comes to heat exchangers. 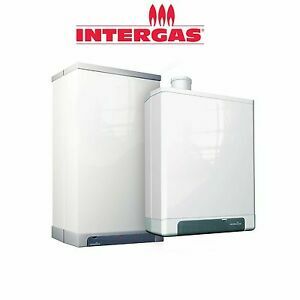 Unlike other combi boiler manufacturers, which use two, a primary heat exchanger for central heating, and a secondary plate heat exchanger for hot water, Intergas uses a two-in-one heat exchanger. 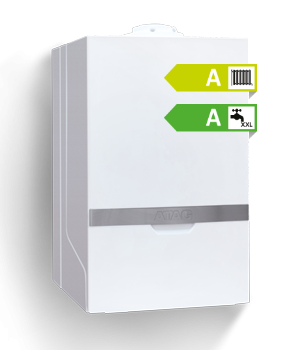 Right now there’s no tangible evidence of Intergas boilers being more energy efficient, because they start at the same (if not lower) efficiency as combi boilers from other brands listed in this post, i.e. between 88.8% and 89%. Same issues as ATAG, not well known etc. Alpha, part of the Immergas Group from Italy, is firmly placed in the affordable or cheap combi boiler category. The boiler-only cost is around £500 to £600, and you could probably get them installed for less than £1,500 inc. VAT. Good if you want to slap a cheap boiler on the wall, sell your house and leave the country. While you may save a small amount of money on the initial cost of installation, you will lose money in lost energy efficiency (i.e. paying more on your energy bills) and repair costs over the years. Alpha Heating Innovation have been inspired by Viessmann for their latest range of combi boilers. Whether that makes Alpha a reliable boiler brand remains to be seen. Glow Worm are now owned by Vaillant, and serve as their “affordable” brand. Combi boiler reviews for any of the cheap brands listed above are not amazing to say the least. We would give any of the brands listed above 3 stars out of 5. Simply because they are great if you want to slap a cheap boiler on the wall, but not great for anything else. The good news is a lot of these traditionally cheap, low quality brands are waking up and improving their boilers, case in point Alpha and Ideal getting inspired by Viessmann and offering stainless steel heat exchangers in their boilers along with extended warranties of 10-12 years. 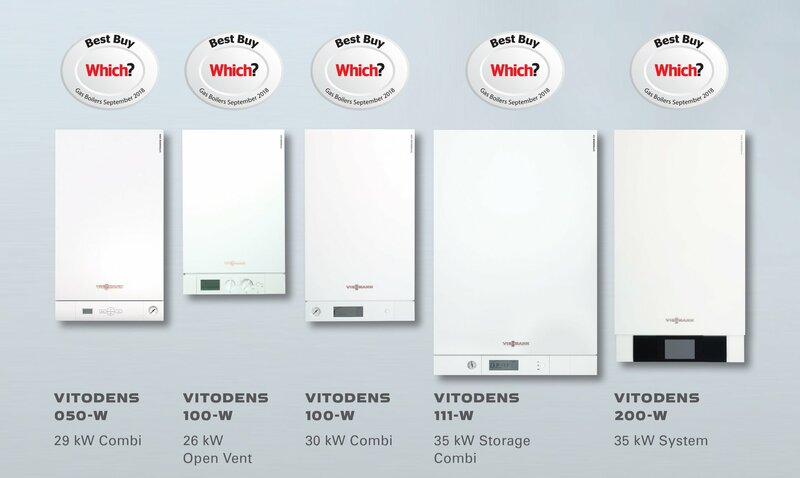 What’s surprising is that some prominent consumer research magazines in the UK give “Best Buy” awards to certain market leading boiler brands in their combi boiler reviews. Then sing endless praises about after-sales service, parts availability etc. But completely ignore or fail to talk about quality of internal components, which is the most important aspect when it comes to boiler reliability and durability! We’ve done detailed guides explaining What is a Combi Boiler and How a Combi Boiler Works on our website previously. In short, a combi boiler has two heat exchangers; primary for central heating, and secondary plate heat exchanger for hot drinking water. With a furnace-like environment inside a boiler, its internal components have to go through ridiculous thermal stresses on a daily basis. More so during winters. Which is where quality of internal components determines how long your boiler will last. It’s amazing so many websites ignore this completely in their combi boiler reviews. I think you know where this is going. Unless you are completely clueless, it’s common knowledge that stainless steel is a superior metal and extremely resistant to corrosion compared to aluminium. Stainless steel also works with a wide range of pH levels. Whereas for aluminum, if the special manufacturer-recommended heat transfer fluids and inhibitors are not used to produce and maintain a narrow pH range, it will corrode much faster and get damaged. 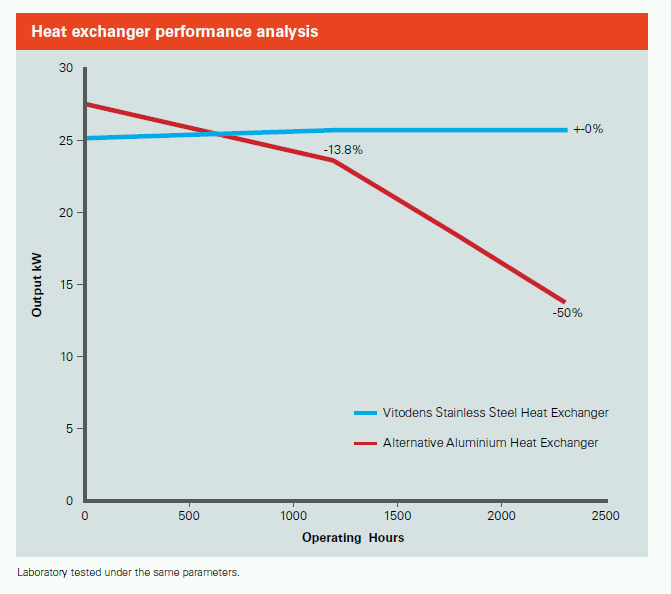 As you can see in the diagram above, while aluminium starts off great initially due to higher thermal conductivity, it drops off massively after the first 1000 operating hours. Whereas stainless steel maintains its efficiency and output for far longer, roughly translating into a much reliable boiler for your hard earned money. Which is why we’ve ranked boiler brands with stainless steel heat exchangers higher than the ones with aluminium. Many people in the UK still ignore facts and go by brand reputation or word of mouth advertising and stick “what they know” on their wall. Only to lose money in lost energy efficiency or boiler repairs down the line.